Full Spectrum Potency: The full spectrum of beneficial compounds found in Turmeric Force is delivered using a supercritical extraction, wholefood approach to herbal supplementation. I was transferred over to this product with recommendation from many websites. I like the natural ingredients in this and New Chapter is really trusted. It was really easy for me to notice the difference. My digestion is now so much better and I also have the feeling of being less inflammated. This really works. Turmeric Force has really worked with me. I feel better now and everytime i feel achy I just takanother one and feel better immediately. This has also worked on my migraine. Q. What makes your whole food vitamins and minerals better than conventional supplements? New Chapter’s Probiotic Nutrients™ deliver vitamins and minerals in the form of probiotically cultured whole food rather than the chemical forms found in conventional vitamin and mineral supplements. Research has shown that nutrients from cultured foods are more potent, bioavailable, and safer than the synthesized or isolated forms. Probiotic Nutrients are also the only line of nutritional supplements made with at least 70% organic ingredients and certified by a third party to the USDA’s National Organics Program. Q. Vitamins usually upset my stomach; will I have this difficulty with New Chapter's vitamins and minerals? 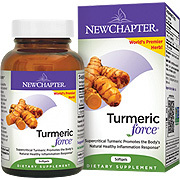 Unlike conventional vitamins and minerals, New Chapter’s vitamins and minerals are food. Better yet, they are pre-digested, organic cultured food. So when you take New Chapter vitamins your stomach is NOT empty: it has inside it a good friend – cultured organic food – waiting to be comfortably digested. New Chapter’s Organic Probiotic Nutrients are also rich in ferment metabolites, bacteriocins and plant enzymes, and they are thus soothing to the entire gastrointestinal tract and promote digestion, detoxification and elimination. Q. How does New Chapter ensure the quality, purity and potency of their products? New Chapter’s Quality Assurance, Quality Control and Regulatory Compliance team have over 47 years combined experience divided equally between New Chapter and related industry experience. From Paul Schulick, New Chapter’s Founder & Chairman, down through the organization, all New Chapter Associates share in our commitment to quality. New Chapter requires that all lots of raw materials used for the manufacture of our products are tested for potency markers, heavy metal contamination and/or microbiological content. Our co-processors forward this information on a Certificate of Analysis for our approval prior to use or shipping. We randomly verify information contained on C of A’s through third-party laboratory analysis. New Chapter does finished product testing on weights, potency, marker assays, micro and heavy metals. We also do expiration date testing on a random basis for the duration of declared shelf life: 18 months to 3 years. Q. Why are New Chapter's potencies lower than conventional pharmaceutical supplements? Short answer: they are not. We reject the theory that supplementation must be taken in huge doses of inert or bi-phasic isolated vitamins. It is a common misunderstanding that milligrams measure potency. They do not! Milligrams measure only weight and do not reflect cellular activity. New Chapter’s Organic Probiotic Nutrients™ deliver biotransformed vitamins and minerals in their finest cultured form, much in the same way as miso, kefir, tempeh, and yogurt. Research consistently demonstrates that New Chapter’s Organic Probiotic Nutrients are more active than conventional isolated or synthetic vitamins. Q. Does New Chapter offer supplements for children? New Chapter currently offers one product specifically designed for children called Immunity Take Care™ for Kids. Other products that were not specifically designed for children but may be safely administered under the guidance of a healthcare practitioner include: Wholemega™, Ginger Honey Tonic, All-Flora™ and Berry Green®. All of New Chapter's products are formulated to support the nutritional needs of the body and maintain its healthy function and structure. The FDA prohibits us from recommending or prescribing products to individuals for disease conditions, however, we can suggest that you speak with a licensed healthcare provider familiar with nutritional supplements to see if one or more New Chapter supplements may be appropriate to optimize your health. Additionally, on our website you may view specific health support protocols by utilizing our Vitamin and Supplement Advisor designed by New Chapter’s Director of Medical Education, Dr. Taryn Forrelli. Q. Can I give New Chapter’s products to my pet? All of our New Chapter products are formulated for adult human beings. Please consult with a veterinarian who specializes in holistic and complimentary care to see if and at what suggested usage you may use an herbal, mushroom, or nutritional supplement product for your pet's specific needs. Q. Are any of your products made in China? Q. Are New Chapter's products gluten-free? Q. Should I be concerned about products containing maltodextrin if I have a food allergy or sensitivity to corn? Generally, corn allergies or sensitivities are a response to the protein portion of the grain, and since maltodextrin is derived from corn starch, it rarely creates immune responses in individuals sensitive to corn protein. However, trace amounts of the protein may be present and we recommend that individuals speak with their health care practitioners about their personal experience with products containing maltodextrin to determine if they are appropriate. Q. Do any of your products contain dairy? The only New Chapter product that contains dairy is Probiotic Immunity™. The form of dairy in this product is probiotically cultured organic milk which is similar to yogurt or kefir. Q. I don't do well with soy foods. Since New Chapter's Probiotic Nutrients™ are cultured in a soy media, will they agree with me? Q. Can I take New Chapter products if I am also taking prescription medications? New Chapter® cannot provide information about combining prescription medicines with herbal or nutritional supplements. We suggest you always advise your prescribing physician or pharmacist about the use of dietary or herbal supplements. Only he or she can determine the risk for herb-drug interactions and supervise your response to the prescribed therapy*. You may also want to consider consulting with a qualified expert in herbal and nutritional therapy on this matter. For a referral database of licensed Naturopathic Physicians and Holistic Medical Doctors in your area, please visit: www.naturopathic.org or www.holisticmedicine.org. Herb-drug interactions have been identified with respect to a handful of herbs and vitamins, however the vast majority of this information remains unknown. While herbal medicine has experienced a long history of safe use, this history has not included many of the modern pharmaceutical medications that are frequently used today. By making your health care provider aware of your supplement regimen, you are protecting yourself from any known potential interactions and allowing for any future information on this topic to come to light. Q. Can I take New Chapter products if I am pregnant or breastfeeding? Perfect Prenatal™, Wholemega® Prenatal, Ginger Honey Tonic, Berry Green®, Probiotic All-Flora®, Immunity Take Care®, and Bone Strength Take Care® are the only products New Chapter recommends for use during pregnancy and breastfeeding. Although many herbs and nourishing whole foods have long been used to promote health and comfort during pregnancy, the majority have simply not been thoroughly evaluated in clinical studies for safety during this cherished phase in a woman's life. Therefore, we suggest that pregnant or breastfeeding women use any of our products only after consulting with their health care provider or qualified expert in herbal and nutritional medicine. Not yet! Currently, over half of our products are either certified organic or made with at least 70% organic ingredients. As a certified organic company New Chapter is committed to the organic movement and will continue to source the finest organic ingredients whenever possible. Please refer to the product label or catalog information for the organic status of individual products. Q. Are your products GMO-free? Approximately 75% of all New Chapter products have been verified as fully compliant to the Non-GMO Project Standard. To date, New Chapter is the only supplement company to have achieved this breadth of compliance. For more information on the Non-GMO project and the complete list of verified New Chapter products, please visit: http://www.nongmoproject.org/consumers/search-participating-products/search/?brandId=322. Q. Are New Chapter's products vegan? All of the following New Chapter products are considered vegan: Daily Ginger®, Baikal Skullcap, Broccolive® Plus, Berry Green™, Supercritical Diet & Energy™, Green & White Tea Force, Aloe Vera Force™, Probiotic All-Flora®, Chlorella Regularis, Rhodiolaforce 100 & 300™, Holy Basil, Smooth Food 2™, CoffeeBerry™, Probiotic Anti-Aging, and Probiotic Colon™, Candida Take Care™, Histamine Take Care™, Immunity Take Care™, Urinary Take Care™, LycoPom, and Zyflamend Vcaps, and E and Selenium. New Chapter’s Probiotic Nutrients™ Made with Organic Ingredients do not meet strict vegan standards as the vitamin D utilized for culturing with organic whole food ingredients in our vitamin D-containing products is derived from wool wax. The following Probiotic Nutrient formulas contain vitamin D: Every Man®, Every Man® II, Every Man®’s One Daily, Every Woman®, Every Woman® II, Every Woman®’s One Daily, Every Woman®’s Inner Beauty, Only One™, Perfect Prenatal™, and Tiny Tabs Multi™ and Bone Strength Take Care™. Q. Is New Chapter certified by a third-party? Yes, New Chapter is certified by several third parties. We are GMP (Good Manufacturing Practices) registered by NSF International, the world's leading expert in independent GMP audits and product safety. Additionally, New Chapter and many of its co-processors are certified to the standards of the USDA's National Organic Program (NOP), as well as, in certain instances, the International Federation of Organic Agricultural Movements (IFOAM) and the European Organic Standard (EEC 2092/91). The third party agency providing New Chapter's limited organic certification is by International Certification Services (ICS). Luna Nueva, our organic ginger and turmeric farm in Costa Rica, is certified biodynamic by Demeter International, the largest certification organization for biodynamic agriculture and the oldest traditional organic certification in Europe. New Chapter follows all GMP (Good Manufacturing Practices) protocols for GMP compliance and is currently operating under the FDA's guidelines as mandated in 21 CFR for the food industry Parts 100 - 169. We also have a certified Site License with Health Canada's Natural Health Products Directorate, which we renew every year. Q. Why do you use animal-based softgels instead of vegetarian capsules in many of your supercritical herbals? Because supercritical extracts are so highly concentrated, they will dissolve most vegetarian capsules. However, we are working with a technology that allows us to offer Zyflamend®, our best-selling supercritical herbal formula, in a vegetarian capsule. Turmeric Force is shipped in a discrete, unmarked package. Orders are processed immediately and usually take about 3 to 5 working days to be received. We do ask that you try it for 2 to 3 weeks to feel the full effects. Any information received is used only for order processing and shipping purposes. Your information, such as e-mail address, will never be disclosed to a third party.